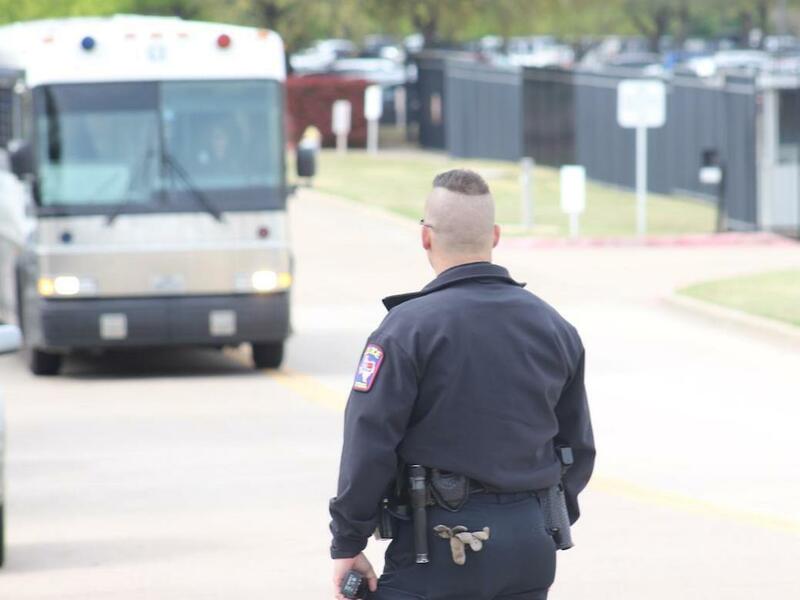 Immigration Raid Results In Arrest Of 280 Workers In Texas Immigration and Customs Enforcement said it was responding to a tip that many workers at CVE Technology Group outside Dallas were using fraudulent identification documents. Immigration and Customs Enforcement raided a cellphone repair company in Texas on Wednesday. Buses left the site a few hours after the raid began, presumably with some of the 280 workers accused of being in the country without proper documentation. ICE's Homeland Security Investigations division received tips that the company — CVE Technology Group — may have knowingly hired undocumented immigrants and that several workers were using fraudulent identification documents, said Katrina Berger, special agent in charge in HSI's Dallas office. Hiring irregularities found during an audit of the company's I-9 forms confirmed those tips. CVE hasn't responded to media requests for comment. Federal hiring laws require that employers have new hires fill out I-9 forms. The laws perform "necessary and common sense functions," Berger said at a news conference Wednesday afternoon. "They ensure U.S. citizens and legal U.S. residents are hired for jobs in the U.S.," Berger said. "They also ensure that illegal workers are not preyed upon or paid less than the going wage or otherwise coerced or cheated or subjected to unsafe working conditions without any means of complaint." Businesses that knowingly hire undocumented workers "create an atmosphere poised for exploiting an illegal workforce," Berger said. CVE employee Yessenia Ponce was inside the building in Allen, Texas, when agents arrived. "Man, it was crazy," she said. "We were working like a normal day. ... We just heard screaming, you know, people screaming and stuff. We went out and an officer just said 'follow my voice, follow my voice.' "
In the past year, North Texas has been the site of the two largest single-site workplace raids in the U.S. in the past decade. Prior to Wednesday's raid in Allen, 159 undocumented workers were arrested in the small northeast Texas town of Sumner at a trailer manufacturer. The largest workplace raid to ever take place in the U.S. was in Postville, Iowa, in May of 2008, where almost 400 undocumented workers were arrested. The workers arrested on Wednesday will first be interviewed by ICE, which will make note of "humanitarian situations" such as medical needs or whether a worker is the sole caretaker of another person such as a child. Either way, ICE said in a statement that "in all cases, all illegal aliens encountered will be fingerprinted and processed for removal from the United States." Late Wednesday morning, workers inside the repair plant began texting and calling family members, who arrived and waited outside the building for information. One got a text from his wife, who asked him to call an attorney. Socorro Lechuga (right), who has worked for CVE Technology Group for about six years, was released by ICE agents conducting a raid at the company. Maria Soria (left) came from a nearby town to be with her mother. 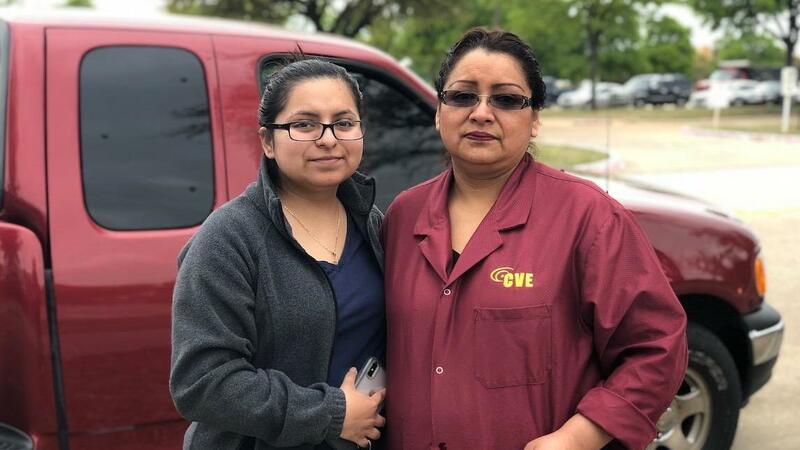 Around 10 a.m., Soria received a voicemail from her mother saying that ICE agents had arrived at the company and that she didn't know what was going to happen. "I was worried at first, because you hear 'ICE' and everything goes downhill," Soria said. "I got myself together," she said, and left work at a health care insurance company to drive to Allen. She called her mother's lawyer, who told her not to worry because, he said, "they'll either release her or set a bond to be released within 48 hours" and that "they can't do anything to her, pretty much, because she does have a petition in place." "So that gave me peace of mind, that at least I know my mom will be OK," Soria said. "As for anyone else here, I really don't know their status or their situation, so that's a whole different story." Mathew Varughese, who says he repairs cellphones at CVE, described the scene inside the company. Agents arrived about 10 a.m. Wednesday, he said, and some employees began running. Agents instructed workers to group together by legal status. Employees who work at the company with legal immigration papers were given green wristbands to wear. By then, the reactions from employees were mixed — "Standing, no talking. Ladies crying," Varughese said. He estimates that 60 percent of CVE Technology employees are women. One woman was in the building applying for a job when ICE agents arrived. She says there were hundreds of people inside. Buses, at least one of which said LaSalle Corrections Transport on the side, left CVE a few hours after the raid began, presumably with workers inside. Some demonstrators yelled toward one of the buses, "We see you; we love you." According to the Allen Economic Development Corp. website, CVE has 2,100 employees, making it the third-largest employer in the city. CVE already had an office in Plano when it moved its headquarters from New Jersey to Allen in 2014. The company was founded by Howard Cho in 1986 and is now headed by his son Edward Cho. In 2014, Samsung accounted for 75 percent of the company's business, but CVE planned to reduce that significantly as it expanded, according to North Jersey Media Group. The company was honored in 2017 by the U.S. Department of Commerce's Minority Business Development Agency with a national award. KERA has reached out to CVE Technology for comment. KERA's Christy Robinson contributed to this report.